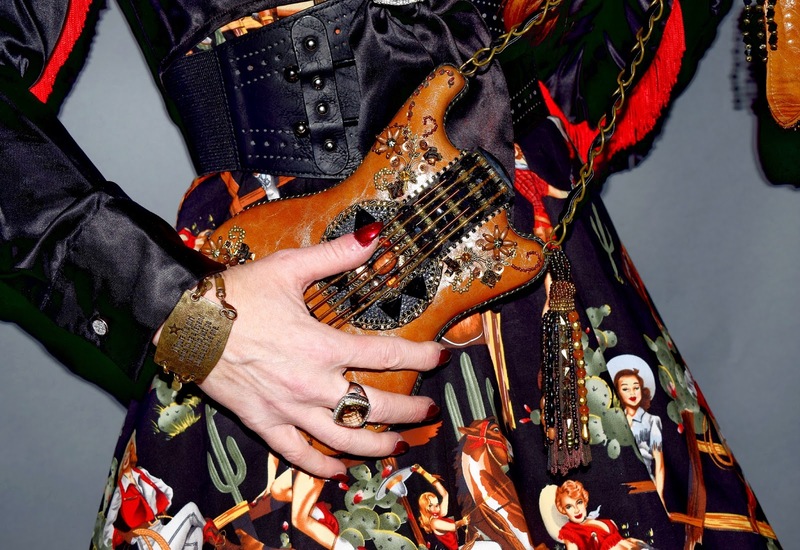 Who can resist a little air guitar when your purse is shaped like one! You know how little kids think they can run faster when they get new tennis shoes? Or how it's really, really hard for them to sit still when those new shoes have little lights on the soles that glow with every step? Well, that's pretty much how I felt when I wore these crystal embellished boots from Roper to the Buckaroo Bash two weeks ago. It might have been because the Eitlejorg Museum of American Indians and Western Art's annual fundraiser featured not just one, but two great bands that played dance-worthy tunes all night... But, I have to admit the fact that my every step sent little constellations of flickering white lights across the dance floor had me more excited about busting a move than usual (now if only I knew how to do a proper Texas Two Step. 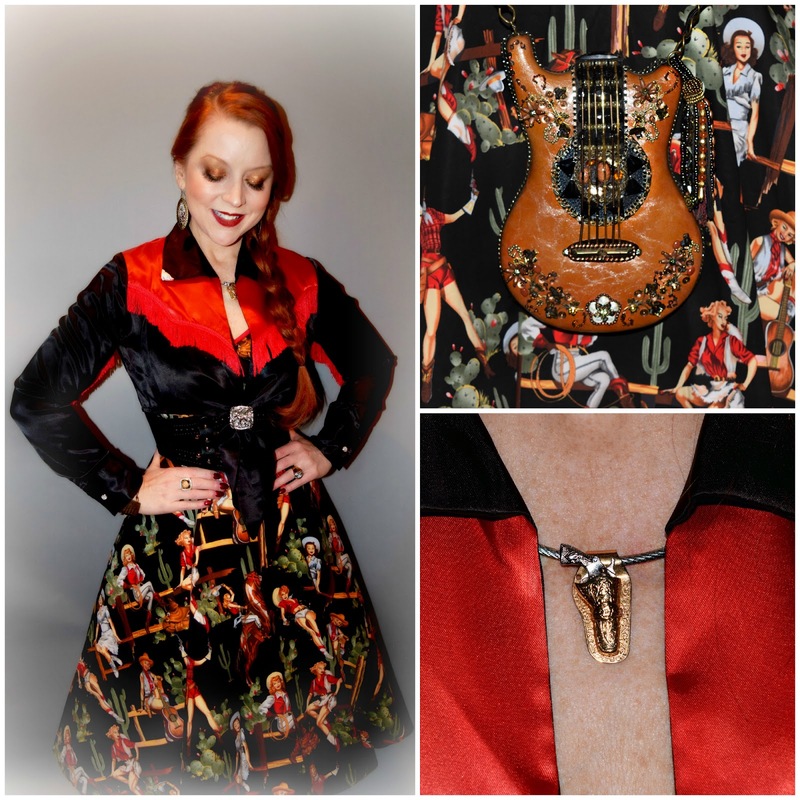 The fringed satin jacket, dress, Mary Frances guitar purse, belt, and six shooter pendant (it actually comes out of its tiny holster) are all eBay discoveries collected over several years. 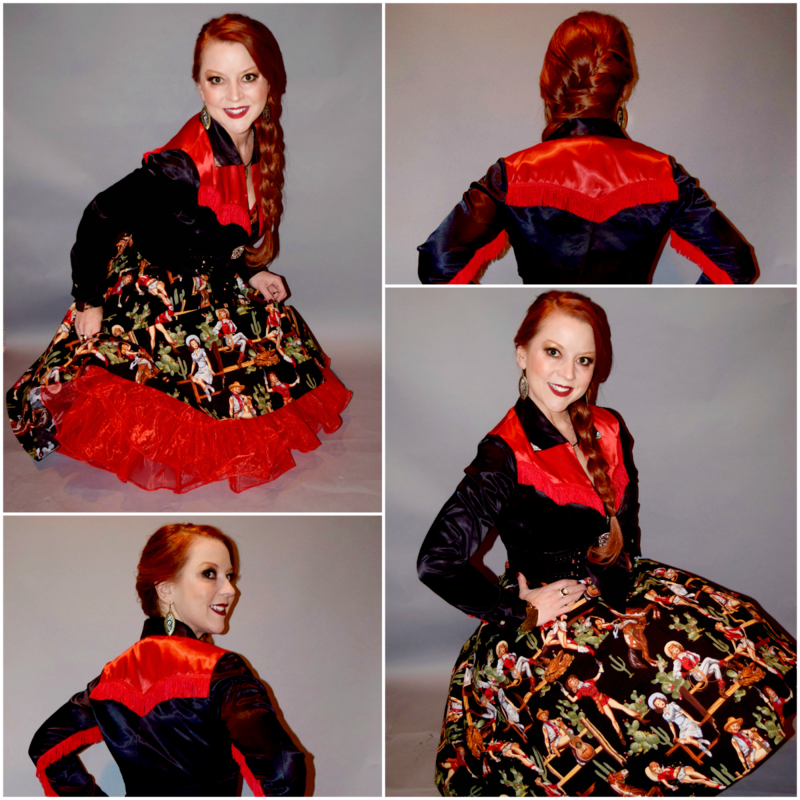 I tend to prefer top-stitching and embroidery over bling when it comes to cowboy boots, but the "How the West Was Won" Western movie-themed event called for a bit of rhinestone cowgirl kitsch...or if you're me, a covered wagon-full of kitsch (you know I can't do anything halfway). 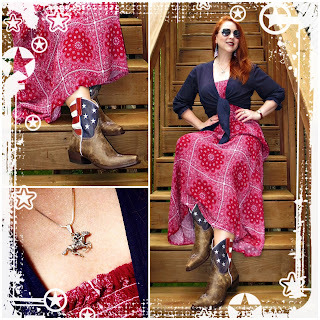 I've had pajamas in this Alexander Henry cowgirl fabric (with a red background rather than black) for several years, and I couldn't resist when I came across this dress from the same fabric on eBay. You can find the dress here, and a similar version with a blue background is available here through Amazon. Lenny & Eva "Sentiments" bracelets like this one engraved with a Calamity Jane quote are interchangeable with each other and with different leather bands; Ring (David Yurman, G. Thrapp Jewelers). 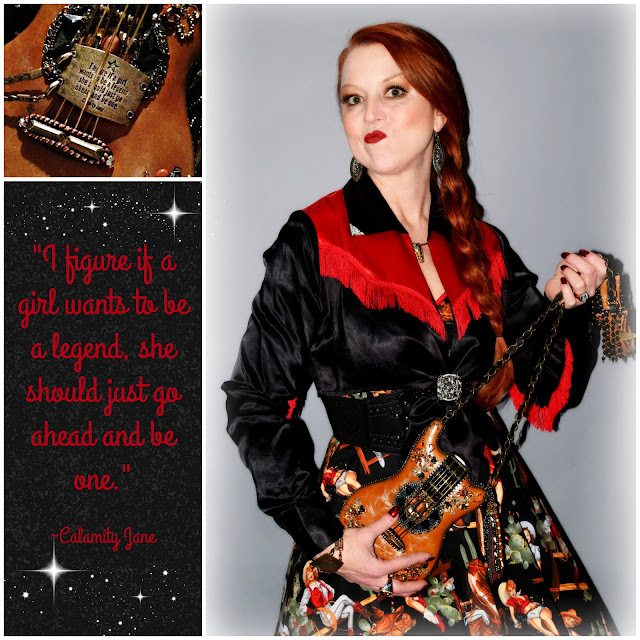 The theme also called for my favorite Mary Frances guitar purse; my six shooter pendant; and a brass and leather bracelet from Lenny & Eva engraved with a quote from Calamity Jane: "I figure if a girl wants to be a legend, she should just go ahead and be one." I wear the bracelet a lot...it's a reminder to fearlessly be myself, and it always makes me smile because I've been called Calamity Jane a time or twelve myself due to my penchant for calamitous slips, trips and falls. 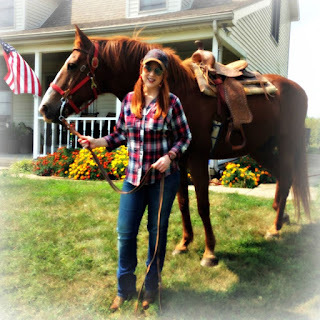 Remember this Calamity Jane post?! A red crinoline from Amazon was in order for the Bash to give the dress more structure (and, like the boots, it made me want to twirl around), though I was a bit surprised when a stranger asked if she could look under my dress...but then she told me it reminded her of her "dance party clothes" as a teenager in the 1950s. I have an entire "cowgirl room" filled with Western art (even the light switch covers are hand tooled leather); and my first original and still favorite piece of art (which I affectionately call "The Cowboy Crotch) looks like it could have come from the Eitlejorg's collection. So, I was really pleased to have an opportunity to kick up my heels to support the museum's fundraising efforts. The small Western themed silver "buckle" on my jacket is actually an elastic and metal ring I picked up in Las Vegas for $10 last month. It was also great to see how much the other guests embraced the theme. 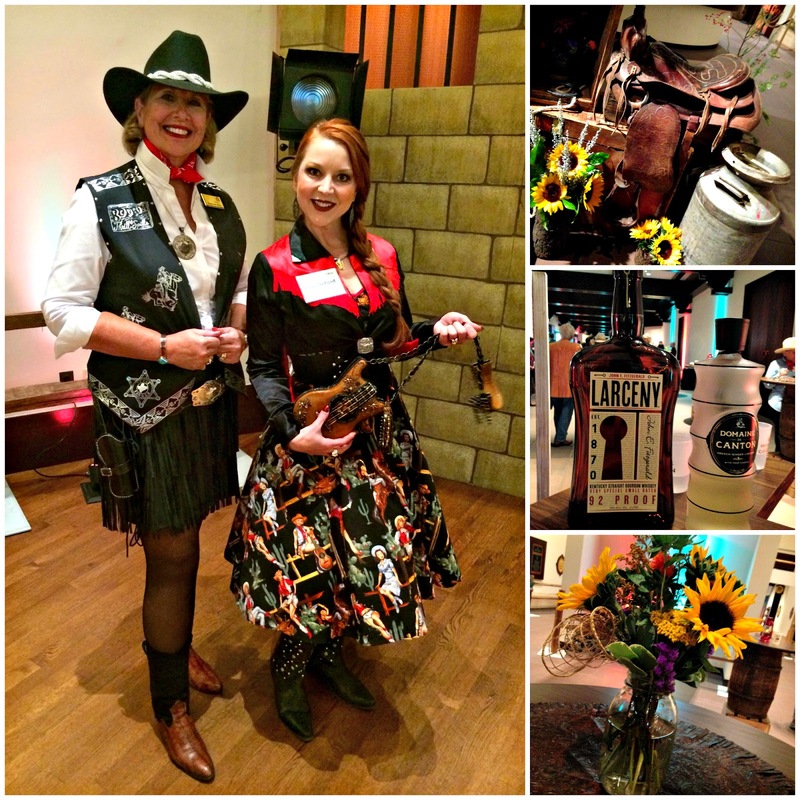 From cowboys and saloon girls to Texas Rangers, the Wild West spirit was alive and well in Indiana! From decor to wardrobe, Eiteljorg volunteer Deborah Kish (left) and the rest of the Buckaroo Bash committee did a great job "setting the stage" for the Old West move-themed event. Fantastic post.Thanks For share this post with us. profit the health yet as be modern and helpful wrist joint accessories. Magnet medical aid has been around for a few time currently guitar bracelet and also the advances in jewellery fabrication have allowed jewelers to create elegant and sleek bracelets made from magnets.